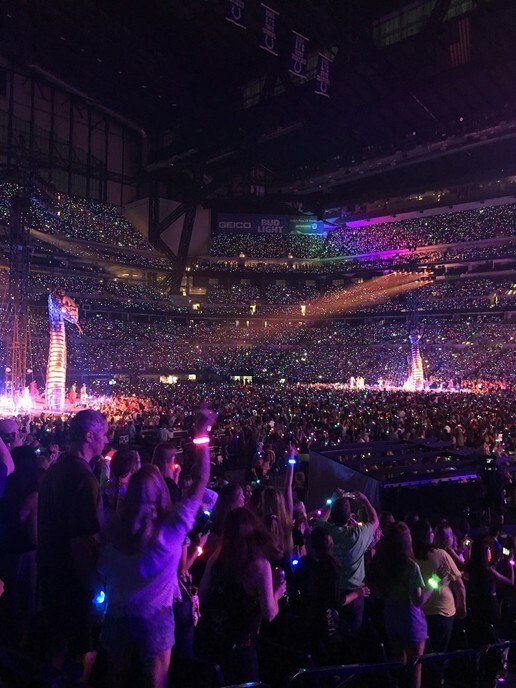 “Are you ready for it?” That’s a line from the first song Taylor Swift performed Saturday night at Lucas Oil Stadium and was an apt way to start the massive production that is her Reputation Stadium Tour. I don’t know if anyone was ready for what Swift had planned (and executed exceptionally) throughout the night. Six outfit changes, 3 stages, fireworks, a working fountain, and oh yeah, 50-foot tall snakes were all in the game-plan for the 2-hour show. Swift opened with “Ready For It” followed by “I Did Something Bad” both from her latest album, “Reputation” The 1-2 punch set the tone for the show using massive screens and an X shaped stage. Massive balls of fire shot up from the top of the stage during the line “they’re burning all the witches even if you aren’t one” which was a nice touch. The show was split into 6 different acts each roughly 3-4 songs each. 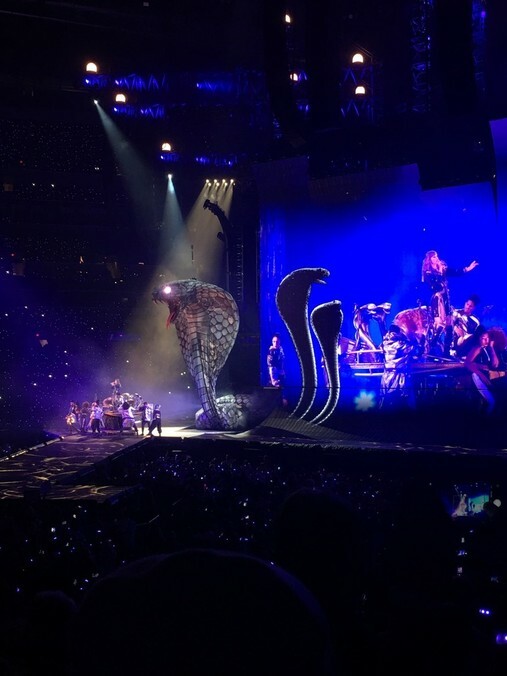 “Look What You Made Me Do” opened Act 2 with giant inflatable snakes emerging from the stage. Some other highlights of the night included Shake It Off, a dance party on one of the two side stages in the arena with openers Charli XCX and Camilla Cabello that included the use of light-up bracelets that were distributed to each person in attendance. The bracelets were incorporated multiple times throughout the night, but “Shake It Off” used them to their full potential. Swift also showed off her musicality during Act 3 with an acoustic performance of “Dancing with Our Hands Tied” and “Forever & Always” which was the randomly selected song of the night and the first time she had performed it live since 2013. Afterwards, she proceeded to the third stage on the other side of the stadium floor to perform “Blank Space” and “Dress” before hitching a ride back to the main stage via a snake-themed transportation device that soared her over the audience while performing “Bad Blood”. Swift did a fantastic job of connecting with the audience throughout the night mentioned that it was her 13th time playing in Indiana (her lucky number) and that years ago she played a concert for the annual FFA convention in Lucas Oil and dreamed about one day playing the stadium on her own headlining tour. She also thanked her fans for sticking with her for so long. She mentioned how a lot of times in life you go through musical “phases” where you like certain artists and then move on when you grow older. However, she mentioned earlier in the night how she met a fan that was in her 20’s and the fan said “I’ve been listening to you since I was 10” and how that happens to her just about every night during meet & greets. It was a very sincere moment during the technical astounding show and was a genuine interaction with the audience. Two other highlights were “Don’t Blame Me” featuring a guitar solo and some advanced instrumentation by her stellar band, and the final mashup of “We Are Never Ever Getting Back Together” and “This Is Why We Can’t Have Nice Things”. The final few minutes featured a working fountain that Swift stood and danced on, fireworks, and her entire crew of backup dancers in full force. Swift said she dreamed of headlining stadiums, but it’s clear from Saturday night’s performance she thrives in them.